Me and my hunting buddy went out opening morning, we left my house at 3:30 am, got to our spot and had decoys on the water and a blind made of phrag by 5:30... then the wait!!! shooting time is always 7:30 am on opening morning in Utah, at 7:13 we had 42 ducks sitting in our decoys, mostly teals and the BIGGEST malard i've ever seen. by 7:28 every last one of the ducks had left. right at 7:30 the war began, we were lucky that our nearest nieghbor was about 150 yards down the dyke, we only got peppered once, i'm sure we returned the favor. anyways, we killed 10, mostly teals, didn't see a green head, the geese were staying in the upper atmosphere. we had a great day. Nice going, Dune! You probably see some cinnamon teal in Utah. 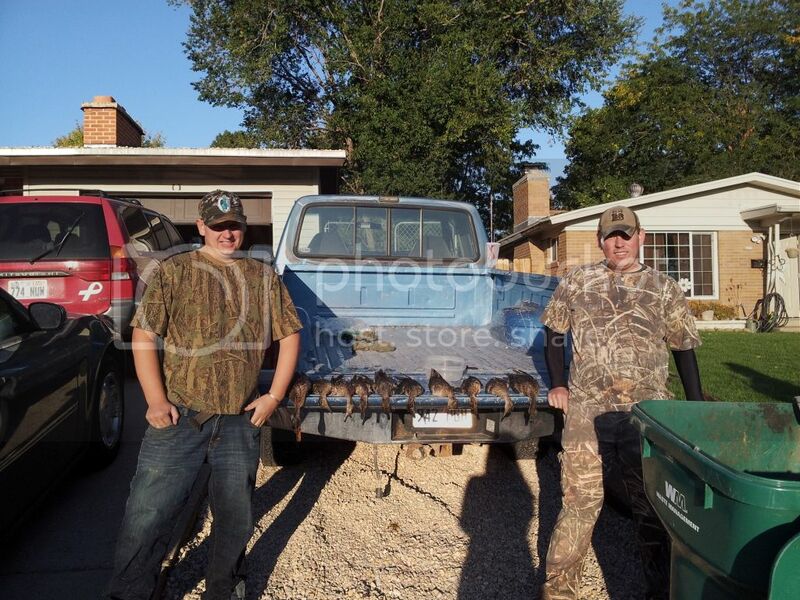 We kill a few (very few) cinnamon teal in Iowa because they are more of a western bird. yeah, last year i killed a few cinnies that came through real late. those teal are a hoot to shoot, like shooting at a hummingbird, they are so fast and small. Yeah on that! And teal bunch together after the first shot. Normally they do, but opening morning they were acting like fighter pilots. after the first shot, they'd all take some evasive manuveurs and scatter like a squadron of jets, it was fun to watch, they were also bombing down into our decoys so fast and hard that some times we didn't even see them till they splashed down. you could hear the air whistling between thier fethers when they'd cut and bank. Looks like a pretty good mess. I've tried waterfowl hunting and never could really get into it. I've gotten a few ducks and geese, but it's just not my cup of tea I guess. Too much shooting and not enough "bang for your buck".